By far the rarest of all the “jewels that play with light” is alexandrite. Despite the fact that it is the precious birthstone for June as well as for a 55th wedding anniversary, it is not well known by the public. It may surprise many people to learn that this gem can be far more expensive per carat than diamonds.… that is, if it is indeed the original old-mine alexandrite that one is talking about. So what exactly is alexandrite, anyway? Alexandrite belongs to the chrysoberyl family of gems, of which there are three varieties: the typical chrysoberyl usually seen in shades of yellow to light green; cymophane which is commonly known as cat’s eye; and alexandrite which is the only one of the family that exhibits a definite color change. However, unlike opal and moonstone whose change in appearance is dependent upon the angle of view of the person seeing the gem, alexandrite’s color change is dependent upon the type of ambient light – whether it is daylight or artificial. A quick look at how chrysoberyl is formed helps to explain how this effect occurs. The subterranean magma that ultimately forms chrysoberyl has a larger percentage of water in it and also has a higher concentration of rare elements; if one of those elements happens to be beryllium crystals then either beryl or chrysoberyl are likely to form. Confusingly, beryls and chrysoberyls are entirely different gem families – we can blame the gurus of mineral and gem naming for that one! So if all three types of chrysoberyl contain beryllium, why don’t they all behave like alexandrite? The difference lies in the amounts of yet another element – which in this case is chromium in alexandrite, versus iron in ordinary chrysoberyl and cat’s eye. Of course Mother Nature does not always do things in a precise scientific manner and so sometimes a slight color change may be observed in an ordinary chrysoberyl, leading it to be incorrectly classified as alexandrite; however, examination will show that a chrysoberyl will not florescence under a UV light, whereas alexandrite will do so. There are a few different stories about the discovery of alexandrite but all pretty much agreed that it was first found in 1830 in the Ural Mountains of Russia. It was officially named in 1839, from the Imperial Russian military colors of red and green which were the actual colors that the stone exhibited according to the ambient light in which they were first viewed. You can imagine that this new gem was seized on with delight by the Russian aristocracy and jewelers – and that furious mining proceeded apace! 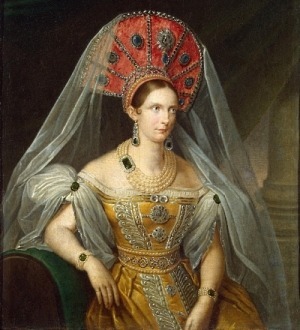 An interesting theory has been proposed about the portraits, shown below, of Russian Empress Alexandra Feodorovna, which were painted in the mid 1830s. 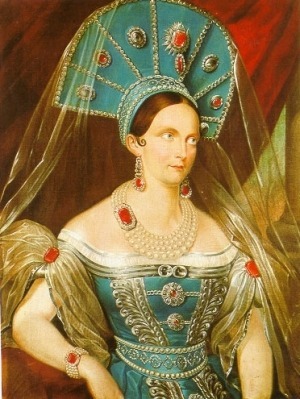 One portrait shows her jewels as being all red, another painting shows them as being all green, and the third one shows them as several of each color! The theory (which can be found here -scroll down a bit for the English translation) states that the gems are actually alexandrite rather than being either rubies or emeralds; interesting and actually possible, given the fairly recent discovery and naming of alexandrite. As you can also imagine, by the late 19th century the stone was pretty much almost entirely “mined out” at its original locations. This is why all examples of the true, original, fine Russian alexandrite are now only found in (or taken from) antique pieces or long-standing collections spanning multiple generations. The simplest description of the color change seen in alexandrite is that it appears green in daylight but red under artificial light. However, such a description does not give any idea of the wide range in color variation this gem can exhibit. When people see a natural alexandrite they may even be disappointed in what they perceive as its dull coloration because it might seem like some shade of not-very-exciting green and they may well wonder what all the fuss is about! In fact you may think at first look that the stone is rather boring but nothing could be further from the truth. The secret lies in the type of lighting in which the stone is viewed, as well as the natural structure of the human eye. 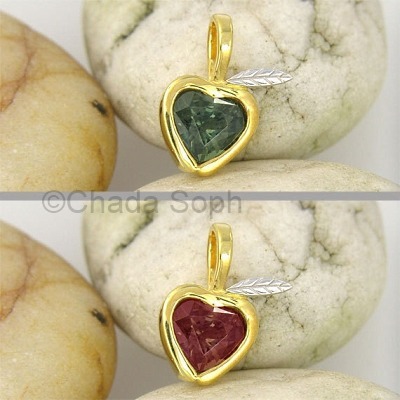 The color change between red and green in alexandrite depends on the color spectrum of the rays of light that strike it. This change is called pleochroism, and stones that exhibit it are termed pleochroic. Examples of light sources that contain a larger amount of red are candlelight and incandescent light. Natural daylight contains more blue. We see this effect every day in our homes when we go into a room with painted walls illuminated only by the light coming in through the windows, and then go into the same room at night and turn on a light fixture that contains an incandescent bulb: That same wall paint color now has a distinctly warmer or more yellowish tone, especially in the areas closest to the light fixture. The perceived change in paint color is due to the fact that incandescent bulbs emit light that contains more red and/or yellow rays – and is why the popular Reveal light bulbs, which have a special blue coating to neutralize the “warm” light coming from their incandescent filaments, are rightly advertised as maintaining the true color of the room surroundings when the light is turned on. In a perfect world, a natural alexandrite should look green or blue-green in daylight or under a “daylight” flourescent bulb (remember, daylight is predominately green and blue) and then appear as a rich ruby red or purplish red under incandescent, mixed artificial, or candle light; the colors should be intense or at least relatively vivid instead of being washed out and weak looking. It is said that the modern era alexandrites from Brazil often perform best as far as color change percentage. In the best stones the change of color should be uniform and fairly complete over the entire stone; those that have sections in which one color seems to predominate over the other while both are visible are known as having ‘color bleed’ and while this is fairly common it also does reduce the overall value and price of the stone. A more realistic evaluation of a very good quality natural alexandrite would be to say that it could be blue-green, emerald green, or even a dark teal color in daylight and would change to a purple-red, garnet-red or ruby-red under artificial light.… keeping in mind that it is perhaps not realistic to expect most modern stones to look equally good under both kinds of light. The one of a kind engagement ring below exhibits a nice rich consistent blue-ish green daylight color. If I were buying a piece of alexandrite jewelry I would think about under what type of lighting conditions I would be most likely to wear it: If primarily in daylight or under “daylight fluorescent” lighting, I would look for a stone that exhibits the best color under those conditions but if I knew I would be wearing it mainly under incandescent or mixed artificial lighting (such as when going out for dinner) I would probably opt for a stone that looks best in that environment. When the original Russian alexandrite mines were finally depleted in the late 1800s, it was thought that this might literally become a “lost gem” but then in 1987 alexandrites were discovered at a place called Hematitia in Brazil. They exhibited good color and color change although neither as strongly as the old Russian stones did. It is a fact of life that no stones from any other location exhibit all of the wondrous qualities of the original 1800s Russian gems. During the last several decades alexandrite has been mined in such disparate locations as Ceylon/Sri Lanka, southern Tanzania, India, Burma, Madagascar and Zimbabwe. 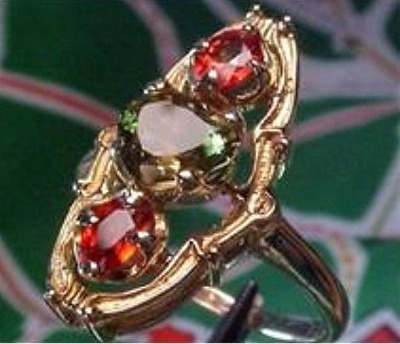 The stone in the ring shown below comes from Madagascar. Each location has its characteristic pros and cons as far as the appearance of the stones; for instance most stones from Sri Lanka have a good green level of color in daylight but are at best a brownish red in artificial light. Nowadays most newly mined alexandrite comes from India and in particular there is a mine dating from 2005 located in the town of Narsipattnanm that produces stones with good clarity and color and of a slightly larger size – however the majority of the stones from India show only a moderate color change. A notable exception were the stones that came from the Samunda mine which sadly closed in the early 2000s after only a few years of production; these stones had a beautiful bluish green color in daylight and dramatically changed to a deep plum-red-purple under incandescent. An unusual property of some of the stones from Brazil and also the mines near Araku in India is a cat’s eye effect similar to that of one of alexandrite’s “sister” stones in the chrysoberyl family. Alexandrite is one of the hardest stones, rating 8.5 on the MOHS scale which means that the only two stones harder than alexandrite are corundum and diamond! In the case of alexandrite the two important C’s are color and clarity. Naturally, the closer the colors approximate pure green and pure red the higher the value; another color consideration is the percentage of color change. The official color change percentage rates were set by the American Gem Lab and state that a stone in which all of the facets completely change color is considered to have a 100% color change; if only half of the facets change, that stone would have a 50% color change… etc. etc. 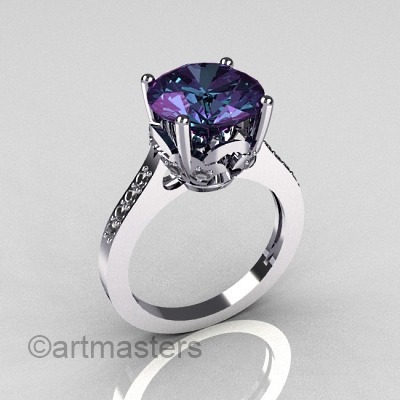 Alexandrite with a 90% or higher color change is typically considered fine or gem quality. It is easy to see how the color change of any given stone will be highly influenced by the lighting under which it is examined by the buyer and the seller – a stone that might have looked emerald green under the precisely calibrated daylight fluorescent lighting in a jewelers shop environment will not look as vivid a green when the buyer gets home and looks at it in her living room while standing in front of a window. Thus a clear understanding of how much (which is in fact considerable) the ambient light will affect the appearance of an alexandrite is critical in order to avoid disappointment. Clarity also comes into play but for most people it takes second place to the color properties of a stone. Within the GIA grading system alexandrite is considered to be a Type II which means that inclusions are expected. Due to its rarity, the market prices of fine gem quality natural alexandrite are sure to bring on acute sticker shock in all but the most well-heeled of purchasers. 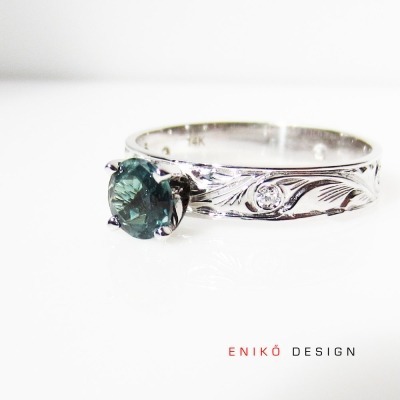 As a ballpark example, for a faceted (cut and finished) alexandrite weighing anywhere from 1/2 to 1 carat and exhibiting the most intense colors and color change properties one would expect to pay from $5000-$15,000 per carat; the same stone weighing over 1 carat could sell for as much as $100,000 per carat depending on its actual size and other properties. The same stone with a less desirable color change or intensity might range from $3000-$9000 per carat if one carat or less, and as much as $70,000 per carat for a larger stone. One with a color intensity or change classified as weak would be in the relatively affordable range of $100-$1000 per carat… still not exactly the sort of thing you might be likely to add to the office holiday grab bag items! The 1.73ct Brazilian alexandrite and Madagascar ruby ring shown below was put up for auction in 2010 with a pre-sale estimate of approximately $10,000. It should be mentioned that most alexandrites tend to be of one carat or less in weight. 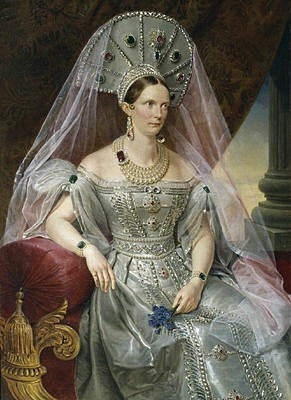 The old Russian stones tended to top out at about 30 carats max, and were typically no more than 5 carats. You’ve probably noticed that I have used the adjective “natural” many times when discussing alexandrite in the sections above, and that was deliberate because there are quite a few stones that look or act like – and thus may be either mistaken for or deliberately sold as – the real deal. Let’s take a look at the natural stone look-alikes first. Color Change Sapphire: Some sapphires from Tanzania exhibit a visual color change similar to that seen in true alexandrite. The most common appearance is a sort of brownish green in daylight and red under incandescent; for this reason, these particular stones are often called “alex type sapphires” in the trade. They are attractive stones and interesting, especially if one understands that what they are buying is a sapphire rather than an alexandrite. There are actually two different color change categories of this kind of sapphire: the green to red type, which is the one properly called an alex type sapphire, and also a blue to violet or purple type. Color Change Spinel: These stones are currrently found in mines in Sri Lanka in relatively small quantities. There are two slightly different categories of color change in this stone: either from violet or blue-purple in daylight to a sort of violet-red under artificial lighting, or from the violet/blue-purple in daylight to a truer blue under artificial lights. In either case some level of blue is always present, which means that the color change is not really the typical alexandrite type spectral opposite of red-to-green. 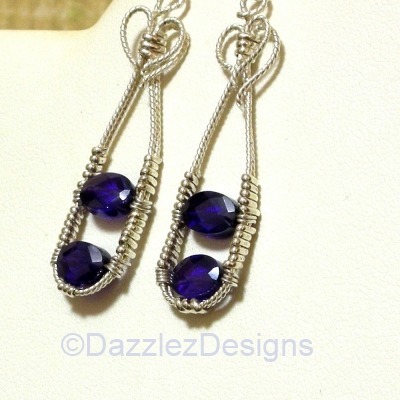 The pair of earrings shown below exhibit nice deep blue and purple tones in the respective ambient lightings. Andalusite: This is another African-origin stone that is sometimes called the “poor man’s alexandrite” because it does exhibit a type of color change although not to the extent or intensity of alexandrite. Confusion often results because true alexandrite is also mined in some locations in Africa. Color Change Garnet: The best natural stone approximation of alexandrite, and often worth acquiring in its own right, is natural color change garnet. Many of the best of these stones are from southern Madagascar and often the colors are quite rich and vivid. This is an unusual garnet because although both the red and green (known as demantoid) garnets are known in the trade, it is not that often that one finds a stone that can exhibit each color under specific lighting. The apple shaped color-change garnet below offers nice deep color under either kind of lighting. However, color change garnet is not always limited to only green and red. Here’s a very unusual stone, mined in Africa, that has a daylight color of teal blue instead of green; in artificial light it appears a fuschia-red. Color Change Chrysoberyl: An article published in 1994 by Mr. Ron Campbell of the Central Coast Gem Laboratory and entitled “The Misconception and Erroneous Marketing of Alexandrite versus Color Change Chrysoberyl” mentions an “influx of” this type of stone from mines in South America, East Africa and Sri Lanka and that such stones were being marketed and priced as true alexandrite. His short but excellent article, a copy of which may be found online at http://www.gemsociety.org/info/igem13.htm , includes a very detailed but easy to read specific color shift chart for alexandrite, for purposes of comparison with other similar appearing stones. It is well worth reading if you are at all interested in alexandrite and wish to protect yourself against buying something that may look similar but is not the the real thing. Synthetic gemstones are nothing new; the process dates back over 100 years. A synthetic stone is manmade but has the same appearance, chemical formula and crystal structure as the true gemstone that it is intended to imitate; a simulated or faux gemstone may look like the natural stone but does not have any of the chemical or internal physical properties of the real one. Synthetic alexandrite can be created by one of two different methods, both of which are properly and correctly described as lab created or lab grown alexandrite. One method is called “flux”, and the other “Czochralski” after its Polish inventor in the early 1900s. 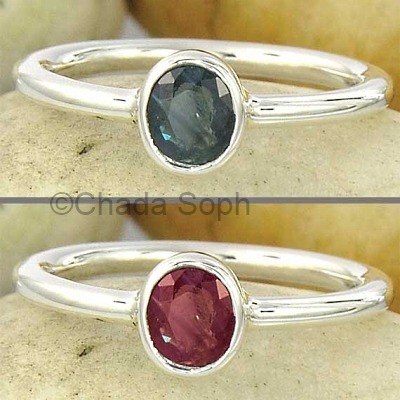 These stones have a color change very similar to natural alexandrite. Microscopic examination may reveal inclusions or bubbles depending on the method that was used to “grow” the synthetic crystal. The synthetic process not only produces alexandrites, but also similar stones such as corundum, ruby and sapphire. 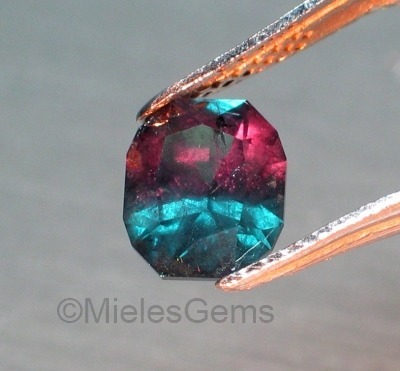 One thing to be aware of when shopping for a lab grown alexandrite is the use of the term “Russian Czochralski alexandrite”. As you now know, Czochralski in a description is a clear indication that it is a lab grown stone; however, to the uninitiated the word “Russian” might give the impression that it is a natural stone mined in Russia. A reputable seller will always clearly disclose the fact that the stone was created in a laboratory rather than being a natural gem taken from the ground. A good laboratory can produce synthetic alexandrite that is extremely difficult to differentiate from a natural stone. These stones will also command premium prices. Many are fully worthy to be set in metals such as platinum and accented with diamonds, such as in this dramatic engagement ring. To increase the general confusion (as if there wasn’t enough already) many gemstones that are described in the trade as lab grown alexandrites are in fact lab grown corundum infused with vanadium which enables the color change effect. 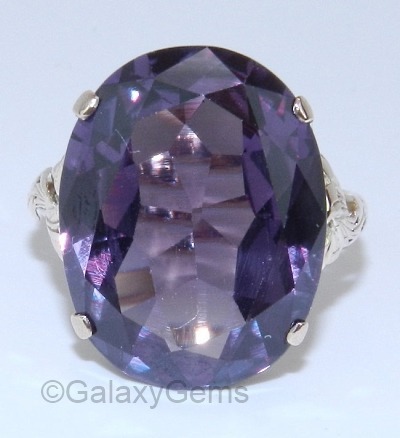 The typical daylight color of these corundum based stones tends to be either purple or purple mauve. Vanadium-infused corundum is often available in large size stones rather than the more typical lab-alexandrite size of 1 to 2 carats. Many synthetic alexandrites were sold to tourists in Mexico and the Middle East in the 1940s; as a result many of them have been inherited by baby boomers from parents or grandparents and the heir often mistakenly assumes (simply because of the age of the jewelry) that these are natural alexandrites even though they are in fact lab created stones. Two forms of popular faux “alexandrite” are rhinestones and glass beads. 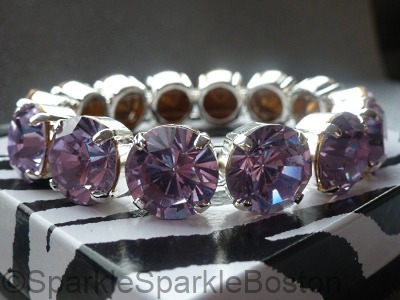 Swarovski produces a deep lavender crystal rhinestone which they market as their Alexandrite color, and some of the lilac tinted rhinestones produced in Eastern Europe are called alexandrite rhinestones. They are very attractive but of course do not have the color change property of the actual gemstone. The bracelet below exhibits the typical fiery sparkle and brilliant refraction of the Swarovski ‘alexandrite’ rhinestones. 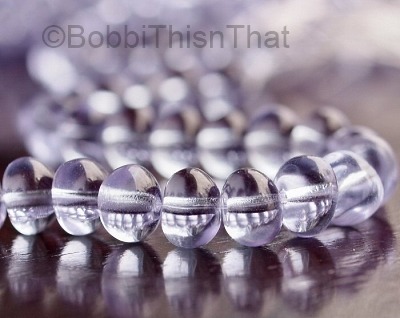 Czechoslovakia-made glass beads are found in the alexandrite color category of lilac to purple. Again, as in the case of the rhinestones, the word is being used only to reference a color and somewhere in the item description there will be an indication that the beads are made of glass rather than being a natural, mined stone. Alexandrite colored glass beads are available in multiple forms and shapes to suit almost any project in jewelry making. I have a beautiful alexandrite its bluish in sunshine with a very bright green and it goes almost brownish to purple with reddish. Several jewelers have confirmed that it is a true alexandrite my grandmother was from Russia I’m about to have it appraised and was wondering will they be able to tell me what the origin of the stone is?